Erik Lindegren is the photographer who decided to trace back the journey of a shrinkwrapped steak. He photographed dismemberment procedures, the scalding of the dead animals, the cut throats and the actual killing. There, on the other side of the food chain, he met the pigs full of despair in their waiting. 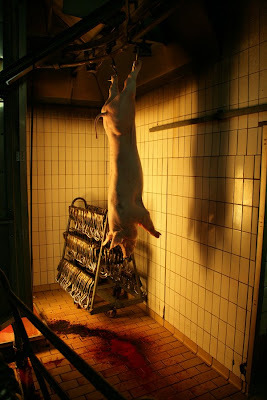 The reality of the slaughter houses shocked him and made him change his eating habits. Now he exhibits his work so that more people will get a closer look at how their dinner is produced. Frustrated, shocked and angry. That’s how photographer Erik Lindegren describes his feelings after his visit at the slaughter house. He had long since had a vague notion that something was not quite right, but he still ate meat and didn’t bother himself to think about it any further. Then suddenly he decided to find out how the steak gets to his plate. - I was prepared for something without really knowing what it was…I suppose that at some level I wanted to prove to myself that it is wrong to take their lives. I’ve always had a strong feeling about what is right and wrong, he says. But he couldn’t just step into a slaughter house and pull out his camera. 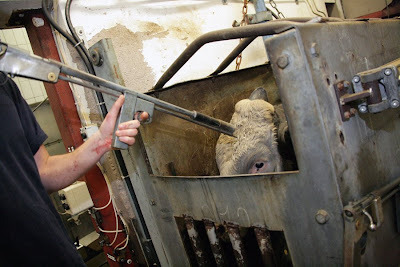 The first time Erik called to some of the slaughter houses in Sweden, they consequently said no. 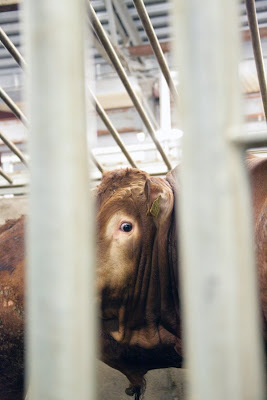 After having called Åke Rutegård, the managing director of the Meat- and Butcher association, and told him that he wanted to take pictures of slaughter houses for artistic use, he was referred to a contact at Dahlberg’s slaughter house in Bråvalla. - I told him that I wanted to follow the production “from animal farm to table” and eventually I got permission to do that, despite the fact that the people at the slaughter house were very suspicious. I got to the see the whole procedure, starting at the end. The further back I got in the process, the more unscathed the pigs looked. 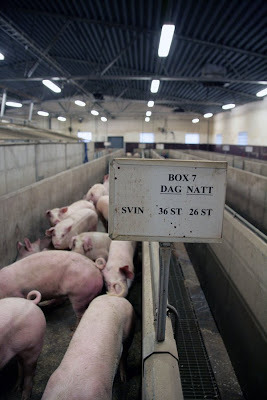 Erik Lindegren says that he will never forget the images of the slaughter house and the anxiety that prevailed there. 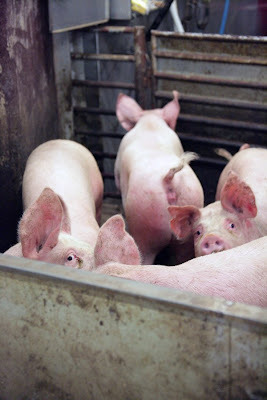 - It was very painful to be there and watch the pigs, realizing that they had given up completely. It was obvious that they somehow knew what was about to happen. They were steered in their corrals, refusing to move at their own will. A man was beating them with a stick and at one time he hit a pig so hard that it squealed loudly in pain. There was such an immense anxiety in there. 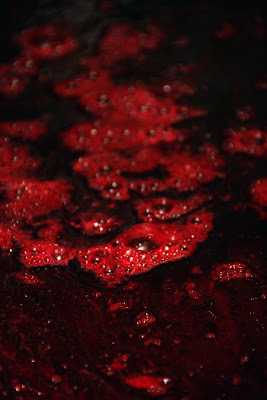 On my part as well; it felt like the smell of the blood was penetrating my very soul. In the slaughter house, the dead pigs were hung right above the pigs that were still alive – the ones waiting for their turn. 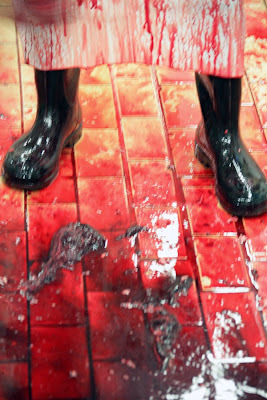 Erik Lindegren stood next to them and saw how the throats of the dead pigs were cut and the blood was pouring out on the tiled floor. 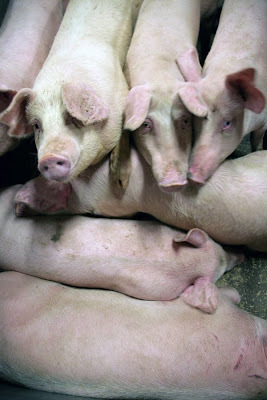 - Many of the pigs that were waiting were caught by panic when they saw what was happening to the other pigs. Just as the dead pigs were hung in front of them, they backed away quickly. Some of them just stood there, paralyzed, breathing heavily. When Erik Lindegren started his project his idea was to document the dismemberment process for his own sake; to get a clearer image of reality. - But when I got there I was so shocked and I am still angry. I am angry because it feels like everything is fake. Humankind is so nice, people are supposed to be so nice, but apparently that does not include other living beings. Also, when I tell people about this no one wants to know, he says. 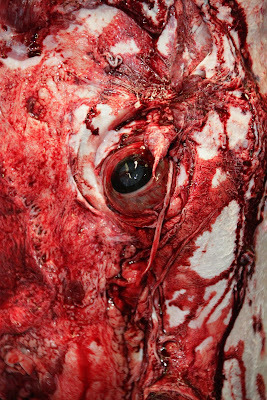 But the photographs from the slaughter house speak for themselves. After Erik Lindegren had put down his camera, emotions swept over him and he eventually called the Swedish animal rights association Djurens Rätt. - I want these images exhibited so that everyone can see them. Everyone should know how animals are treated and how much suffering there is at the slaughter houses. For more information, please visit animalrights.se. You can find the whole series Walls of glass at wallsofglass.se.